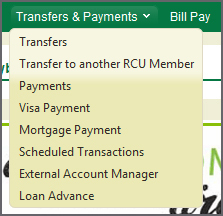 How do I make a transfer between my RCU accounts in RCU Online Banking? Go to Transfers & Payments, select "Transfers." Within the transfer page choose the account the money is coming from. Add the transfer amount and choose a time/frequency. You have multiple options to choose from, including weekly and monthly. Choose a start date and an end date (optional). Click "Next" to continue. Make sure all information entered is correct then click "Confirm Transfer". A confirmation page appears with all of your scheduled information (see example below). To view or edit scheduled transfers go to the "Transfers" page. Click on the "View Scheduled Transactions" link. 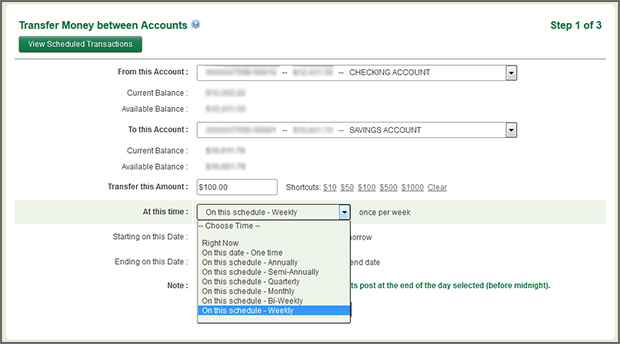 Or go directly to Transfers & Payments, select "Scheduled Transactions." You can edit your transfers on the Scheduled Transactions summary page. "Right now" transactions will appear in your transaction history (see example below). If you scheduled your transfer for Right Now it will deduct that amount from your account. 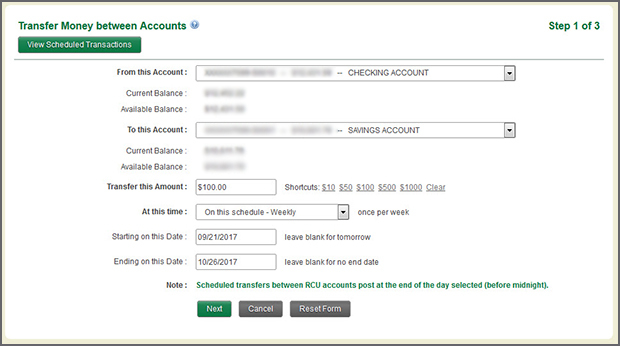 Your transfer transaction will display within your account summary (see example below).